CHICAGO (CNS) — Catholic Charities of the Archdiocese of Chicago and social service providers throughout the state are hoping that Gov. 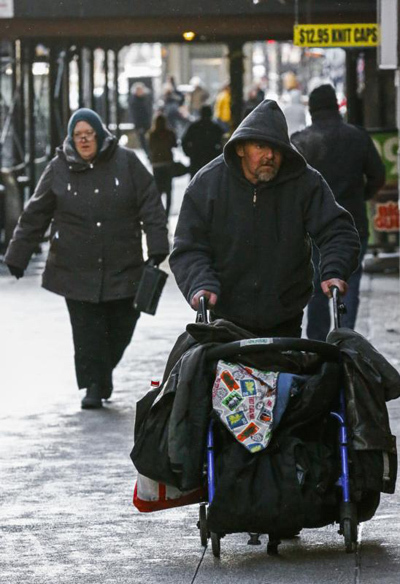 Bruce Rauner signs a stopgap measure that would provide $700 million to agencies that have been waiting for payment for contracted services to the poor and vulnerable since the budget impasse began July 1, 2015. As of midday May 27, S.B. 2038 remained unsigned and the fate of programs contracted through agencies such as Catholic Charities hung in the balance. As of May, the state owed Catholic Charities of the Archdiocese of Chicago over $25 million. That money pays for state-contracted services the agency provides mostly to seniors. The agency floats the state $2 million each month. Catholic Charities in the archdiocese is the largest social-service provider in Illinois, caring for 1 million people annually. While the agency raises about $25 million privately each year, a large portion of its annual $200 million budget comes from government contracts. Representatives from Catholic Charities have been in continuous contact with elected officials in Springfield, the state capital. “We continue to ask our elected leaders to take responsibility and pass a budget that is not balanced on the backs of the poor. This isn’t about politics, this is about people’s lives,” said Msgr. Michael Boland, president and CEO of Catholic Charities. So far, the agency has not cut programs because it has tightened its budget and made reductions, although Msgr. Boland said, “This is becoming extremely difficult.” The agency also launched a separate fundraising campaign, “Keeping Hope Alive,” to help fill the gap in funding. Every 30 seconds, someone in Cook or Lake counties contacts Catholic Charities for help at one of its 160 locations. If the agency were to cut 20 percent of its programs, 200,000 people would be affected — a population about the size of Aurora, Illinois. While Catholic Charities relies on a staff of 3,000, they also have 15,000 volunteers — many from local parishes — to administer services. The $700 million is only a portion of what the state owes social-service agencies for its 2016 fiscal year contracts, said Bob Gilligan, executive director of the Catholic Conference of Illinois, the lobbying arm of the Catholic bishops. In February, Rauner vetoed a measure that would have funded the Monetary Assistance Program, which provides grants to eligible undergraduate students who demonstrate financial need. Several local Catholic universities stepped forward, saying they would cover the entire grants or partial grants for this year. In late April, the governor signed a bill that included funding for just under half the amount the state promised needy students for this school year as part of the Monetary Assistance Program grants. Gilligan noted that it’s not only Catholic agencies that are impacted by the state not paying its contracts, but the entire safety net for the poor and vulnerable throughout Illinois. “As of this month, we have heard that more than 40 food pantries have closed. The safety net continues to crumble around us,” he said. Catholic Charities often refers clients to their nearest food pantry or other providers for services they qualify for that the agency may not provide.